Born July 10th, 2016 in Derry, NH, Cooper is truly a boy that is in touch with his sensitive side. As we have watched him grow, it fills our hearts to watch how Cooper celebrates laughter when you laugh and puts on his game face when things get serious. As with most golden retrievers, Cooper is dedicated to his human moms. Not a thing gets by this guy! He is an amazing protector, which is a bit unusual for most goldens. 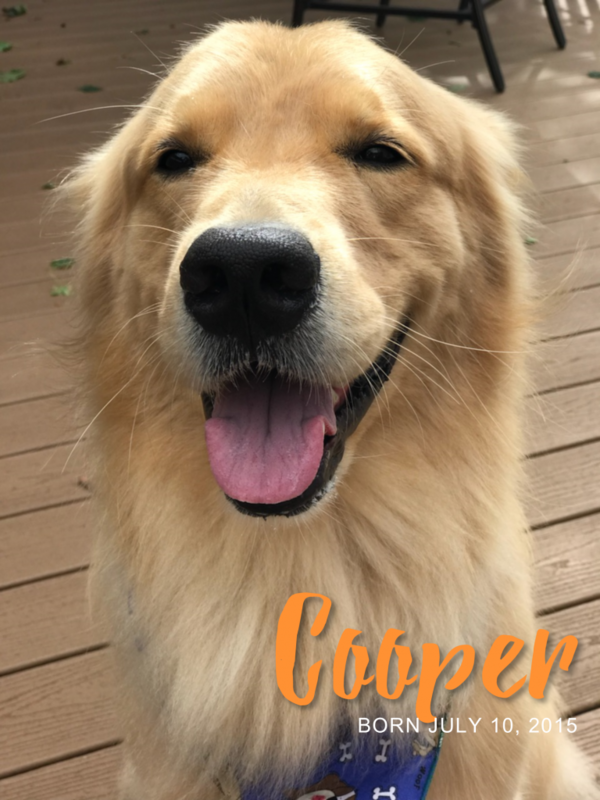 Cooper is truly an amazing golden retriever with a personality all his own. It’s the little things in life that fill our hearts with joy. For us, our joy comes from watching Cooper come in for snuggles when he is sleepy or seeing him try to fit as many toys into his mouth at one time as he possibly can because he wants to play with them all! It’s going for long walks and play-dates with his girlfriend, Quest, and watching the happiness he exudes! He is truly the happiest golden pup on this earth! Our only fear is that Cooper could end up with Hemangiosarcoma just as Nicky and Joey did. Please, if you have a dog that is currently battling cancer, have lost a dog to cancer, or know someone who’s dog is currently fighting for their lives, please help us to raise money and awareness.